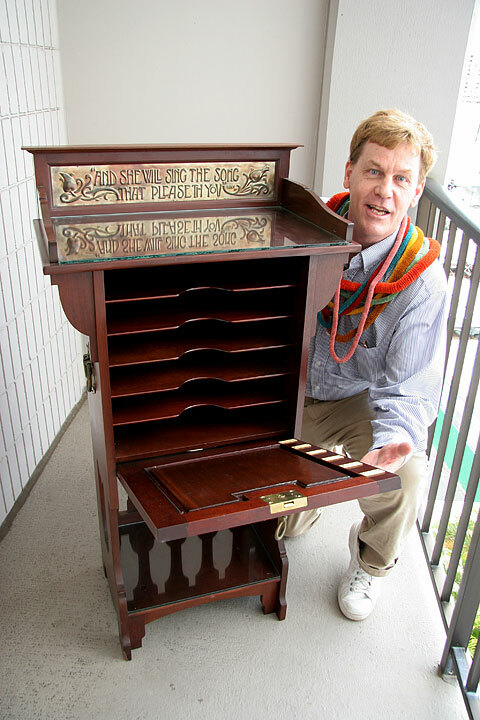 Local treasure hunter John Cook is convinced the music cabinet he bought for $100 at a Goodwill Store in December once belonged to Princess Ka'iulani. "It just can't belong to anybody else," Cook said. He just doesn't have proof. There is no photograph of Ka'iulani with the cabinet or picture of it in Ka'iulani's Ainahau estate home in Waikiki. He is listing the item on eBay for $6.5 million, not because he thinks it's worth that much, but to draw responses from people who think they can prove or disprove his claim. Cook does have an illustration of the music console in a catalog of rare cabinets made by English furniture maker Shapland & Petter Ltd. of Barnstaple. Ka'iulani went to England in 1889 to be educated at Great Harrowden Hall in Northamptonshire. Cook believes Ka'iulani's father Archibald Cleghorn bought the console when he was in England for his daughter's music lessons. 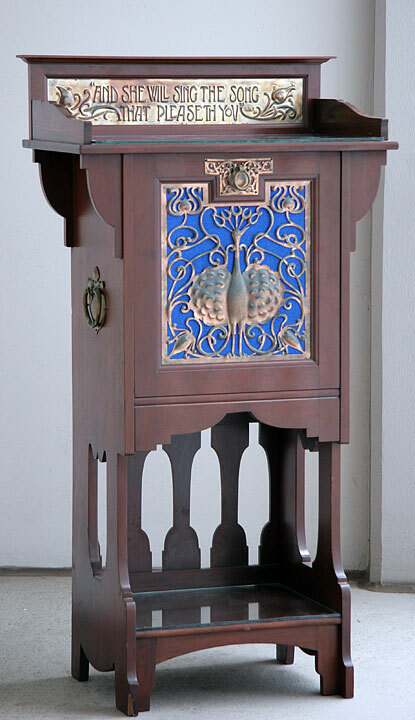 Even if it didn't belong to Ka'iulani, Liberty & Co., a store that commissioned work from Shapland & Petter in the late 19th century, and the Museum of Barnstaple & North Devon are interested in acquiring the cabinet, Cook said. If the cabinet was owned by Ka'iulani, Cook believes it belongs in Hawaii. When he first saw the console in Goodwill's Kaimuki store, Cook said, he wasn't interested in it because he didn't know what it was and he thought the original $399 price was too high. "I thought it was a traveling choir director's podium," Cook said. He bought it when he went back three hours later. The store by then had lowered the price to $100, and he thought the Art Nouveau design of a peacock on the front was worth something. As he researched the cabinet, Cook said everything kept pointing to Ka'iulani, who was known as the Peacock Princess because of her fondness for the birds that she kept on her estate. When he told others of his find and other objects put on sale in the store at the same time, he said a prominent local businessman told him the items had come from the Pacific Club, which sits on what was the Cleghorn estate. The other items included a solid teak dresser made in Denmark and two John Doyle lithographs. "It's interesting if it is, in fact, Ka'iulani's," said antique dealer and appraiser Don Severson, "and embarrassing for the Pacific Club." Cook said he sent a certified letter to the Pacific Club asking about the cabinet, but has yet to receive a reply. Calls to the Pacific Club were directed to committee chairman Jack Gilmar, who did not respond. Ka'iulani was born Victoria Kawekiu I Lunalilo Kalaninuiahilapalapa Ka'iulani Cleghorn to chiefess Miriam Kapili Likelike and Archibald Scott Cleghorn in 1875. She died at age 23 in 1899. If the cabinet is authentic, Severson believes it should be donated to Iolani Palace. But Iolani Palace curator Stuart Ching said the palace is interested only in monarchy items that were at the palace. Bishop Museum Vice President of Cultural Resources Betty Lou Kam said the item would have value if there is documentation connecting it to Ka'iulani. "In this case, there is nothing," she said.